Wow! What a lovely, lovely venue you have in Seven. Just wanted to convey how delighted we were with our experience …a hassle free soundcheck and sensitive adjustments to sound across the evening …the staff were courteous and friendly and clearly very dedicated to the place …a wonderfully intimate atmosphere that the audience really enjoyed, as did we. 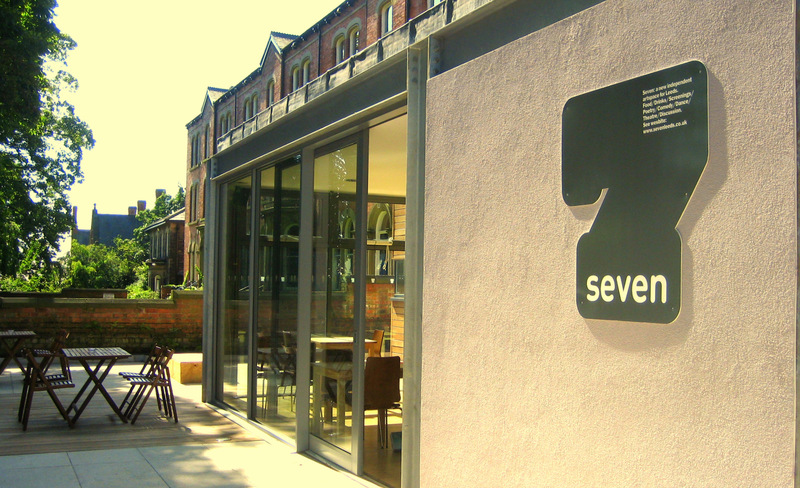 Seven is an independent arts space in Chapel Allerton, Leeds 7. 2019 is our 12th year. The space is small but versatile, providing a hundred-seat venue for film, theatre, dance, music, words and comedy, together with an attractive and welcoming café bar. The building of Seven Arts was the culmination of ten years of effort by a group of local residents who got together to improve community spirit through involvement in the arts. We see Seven as having a pivotal role in linking the various cultures along the Leeds 7 corridor, hence our name, Seven Arts. Our aim is to showcase the best of local and regional talent and attract innovative work from further afield. Seven is a not-for-profit Community Interest Company. “Seven Arts is a credit to everyone involved; by far the best small theatre in the area”. – Jester B, ‘High n Harmony’. As a CIC, Seven sets out a social mission and provides an annual transparent account of how it delivers on this work. It is governed by a small board of Directors. Seven is a genuinely independent artspace. It is not in receipt of core funding from Arts Council England or any public source and must therefore stand on its own feet. The building of Seven was supported by funding from the European Regional Development Fund. Advance tickets for events at Seven are available online from TicketSource, which can be reached from the ‘Buy Tickets’ link on Seven’s website. Tickets are also always available on the door, where not sold out in advance. Seven does not have its own Box Office, so cannot take bookings or reservations by phone. Seven is a very small organisation with no staff to manage a Box Office. By not having a Box Office we are able to keep ticket prices for high quality shows much lower than at larger theatres and venues. Buying tickets through TicketSource involves a 10% booking fee. This sum goes to TicketSource for managing an efficient booking system. For Seven to develop its own Box Office system would involve great expense resulting in much higher ticket prices. Purchasing tickets on the door involves no booking fee. Tickets for less formal, regular events such as Screen Seven, The Cafés, Seven Live are available on the door only. Just check the programme or website. If you have any particular difficulties regarding an advance booking please email Seven at info@sevenleeds.co.uk with details of the problem. If you are unable to print off a ticket, don’t worry, Seven will have a Front Of House sheet with the name in which the booking was made. By Car : Seven is located on Harrogate Road, an extension of Chapeltown Road, 2 miles north of the city centre. The postcode is LS7 3PD. Seven has no car park but parking is free and generally available on Harrogate Road. Parking is not permitted directly outside Seven 8am-9.15am or 4.30-6.30pm Mon – Fri and 12 -1pm Sat. 2-hour parking is available in the Co-op car park, a few yards to the north of Seven. By Bus : From the railway station it is approximately a 10 min walk to bus stops. Turn right on to Boar Lane until reaching the Corn Exchange. Turn left on to New Market Street. Bus stops are on the left. Numbers 2 and 3 go past Seven. Ask for Chapel Allerton centre – the bus stop is just past Aagrah restaurant, which is next door to Seven. By Taxi : it is a 10 minute ride to Seven Arts. We’re always on the lookout for experienced and enthusiastic people to join our bar and kitchen teams, please email us at info@sevenleeds.co.uk with a CV if you think you’ve got what it takes!